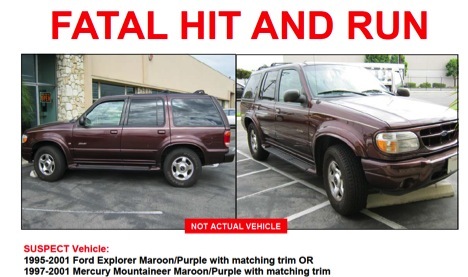 Gardena police distributed a flyer with an image of the kind of vehicle they believe killed Benjamin Torres on Oct. 10, 2012. Anniversaries can be a b*tch. They can be positive reminders of how communities can come together and rally around victims and their families in the face of tremendous loss. But they also mark the years that have passed since those families’ lives were forever changed. And time, particularly in the cases of hit-and-runs, seems only to raise more questions. Families rarely get any answers about how someone could see fit to leave a loved one to suffer and die in the street. Or why the justice system continues to not take these cases very seriously. 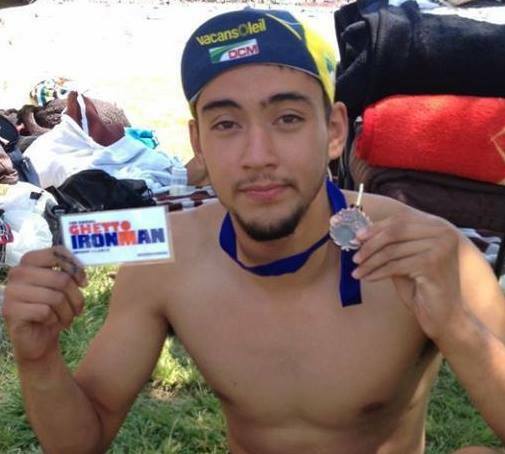 Few things were harder to sit through than the impact statements friends and family of young Luis “Andy” Garcia read at the sentencing of the woman that drunkenly ran Garcia down and killed him and left two other cyclists for dead two years ago last month. We’ll get you next time, in other words, and then you’ll really be sorry! Sentenced last April, she was released this summer, just a month before the second anniversary of Garcia’s death, after serving 16 months of a 42-month sentence. The family got no warning she was being released; instead they saw a photo one of Villegas’ friends had posted of her frolicking on the beach. They had never gotten any answers, an apology, or even eye contact from Villegas — only complaints at her arraignment that wearing an ankle bracelet to monitor both alcohol intake and movement would be inconvenient to a young, working student as well as a challenge for her to pair properly with shoes. Carmen Tellez, mother of hit-and-run victim, speaks to local news outlets following the sentencing hearing for Wendy Villegas. Sahra Sulaiman/Streetsblog L.A.
As horrible as that sounds, in cases where there are no leads, no witnesses, no suspects, and no answers, the questions may be even more haunting. For the family of cyclist Benjamin Torres, killed on his way to Brek Manufacturing in Gardena, where he had worked for six years, the pain remains very present. Almost three years to the day after he was run down between 4:30 and 5 a.m., just a block from a fire station, no more is known about what happened that morning now than was known then. 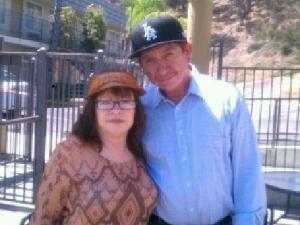 Benjamin Torres and his wife, Maria. All they know is that he was struck by a maroon SUV from behind while traveling on 135th St., that he suffered severe head trauma, despite wearing a helmet, and that there had been significant damage to the vehicle’s front end — the collision left debris strewn up and down the street. As Torres was one of the many “invisible cyclists” that keep Los Angeles running — lower-income bike commuters that are rarely part of the planning around cycling or seen as part of the “bike community” — one of the family’s biggest fears was that his case would fade from the public’s consciousness quickly and, with it, any chances of apprehending the driver. Connecting with the East Side Riders, Los Ryderz, and Ghost Bike Documentary filmmakers eased those concerns somewhat — the bike clubs have held regular rides for justice in Torres’ honor in Gardena. But answers remain as elusive as the pain remains deep. 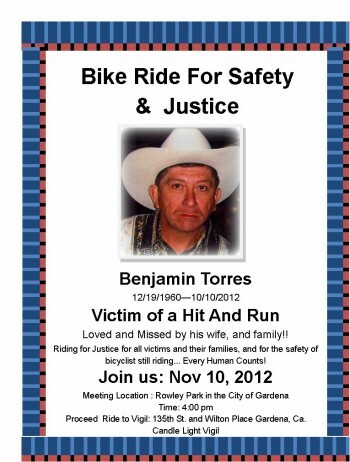 The flyer for the first ride seeking justice for Benjamin Torres. A look at the Facebook event page for the memorial ride that will be held this Saturday, on the third anniversary of Torres’ death, tells the story. Photos stepdaughter Theresa Chaidez posted from the very first ride to the site of the incident — just a month after his death — and the visit his coworkers made to the site speak of the mix of numbness and overwhelming emotion his family and friends felt then. They had choked up and struggled for words when speaking about Torres and what he meant to them. His loss was so sudden, so unexpected, and so horrific that they were still processing the fact that he was gone. In the years since then, there has been no conversation I have had with Chaidez where we haven’t circled back to the loss of Torres to talk about the case and about how she and her family are doing, especially her mother, from whom Torres had been inseparable for 17 years. To their everlasting credit, the families and friends of the victims have turned their anger into advocacy. The movement behind Andy’s Law seeks to impose harsher penalties for hit-and-runs so they are understood by the judicial system as the vicious crimes that they are. Team Andy is a regular presence at a number of cycling events, gathering support for their cause, keeping Andy’s memory alive, and occasionally joining forces with Damian Kevitt (another hit-and-run victim), founder of Finish the Ride and Streets Are for Everyone (SAFE). And the Benjamin Torres Ride for Justice has been a regular fixture in Gardena for three years now, and after being involved in putting up a ghost bike for Torres, the East Side Riders and Los Ryderz have joined with the Ghost Bike folks to aid in setting up ghost bikes to commemorate other victims around South Los Angeles. The momentum from the combination of these efforts made it easier for Assemblyman Mike Gatto (D-Glendale) to propose (and finally see signed into law) use of the Emergency Alert system to aid in apprehending hit-and-run drivers in cases where great bodily harm had been caused. But it unfortunately remains unclear what it will take for the behavior of drivers to finally change. Just yesterday in Sherman Oaks, the driver of a maroon sedan ran down 18-year-old Nysmuh Taylor, made a U-turn to come back and peer out the window at her lifeless body, and then, incredibly, sped off–leaving yet another family with another heartbreaking anniversary to be marked. Join the Chaidez family, the East Side Riders, and the Los Ryderz bike club as they ride for justice on Saturday, October 10, the third anniversary of the hit-and-run that killed Benjamin Torres. Details can be found here.